So the leftovers are dwindling? You have random bits and pieces of your holiday dinner scattered throughout your refrigerator? Did you make one, too many potatoes this year? All you need is 3 cups of leftover mashed potatoes to make the most decadent mashed potato soup I’ve ever tasted. I mean this soup is rich, creamy, and full of flavor with only a few ingredients! My goal after the holidays is to use up and re-purpose all my leftovers. I love to transform them into brand new meals so that everyone isn’t tired of eating a ham dinner for the 15th time in just 3 days. I made over 10 lbs of potatoes for Thanksgiving for just 8 people. That meant that everyone had to eat over a pound of mashed potatoes and we would still have leftovers. The day after any holiday (when I have leftover mashed potatoes) I always make my easy potato pancakes. But then after that if I have any leftover I’m always confused as to what else to make. I did try my friend Joanne’s recipe for Crispy Mashed Potato Mounds which were out of this world delicious. But even after that I still had about 3 cups of leftover mashed potatoes. That is when the thoughts of baked potato soup crossed my mind. Well I should say, Mashed Potato Soup. All I needed were some green onions and bacon to top off the soup and I think I would have been in heaven! 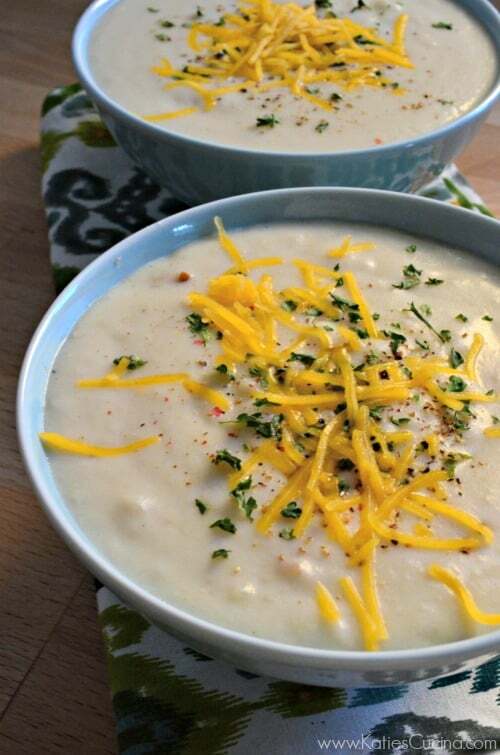 With or without the bacon this recipe for Mashed Potato Soup was out of this world delicious! Go ahead, give it a try and use up the last of your leftover mashed potatoes! In a soup pot melt butter on medium heat, then add in onion. Cook until golden brown (almost caramelized for 10 minutes). Once the onions are golden in color add the all-purpose flour and mix well until the onions have been coated with the flour mixture. Add the whole milk and stir for one minute. Then add in the mashed potatoes. Mixing until all the potatoes have broken up. Cook on medium-low heat for 10-15 minutes or until potatoes are smooth. Taste the soup and add salt and black pepper if desired. Ladle into bowls and top with dried parsley, shredded cheddar cheese, and cracked black pepper. Enjoy! I love homemade potato soup but have never tried it with mashed taters. Sure looks easy! I NEED to try this! Pinning! Made this tonight with left overs from Christmas.. Our mashed potatoes were originally made with Philadelphia Savoury Garlic Cooking Cream. Amazing.. And so fast! Pinned it! So good, the picky kids LOVED it! Jennifer that’s great to read! Glad you and your family enjoyed it. Great recipe – love it! Isn’t your last name Polish? I grew up with many Polish people in Manchester NH & always loved the meals I shared with them. I still make many Polish dishes! Hi Joan, thank you for taking the time to share. My father in-law said that years ago! lol I married a Polish man; however, I am part Polish but also Italian! Hence the “cucina”!